Hold everything!, Hold it!, Hold your ground!, Hold your horses! hold a pen firmly ペンをしっかりと握る. They held hands (with each other). 手を(互いに)握り合った. 〔+目的語+by+名〕〈人の〉〔手・腕などを〕つかむ，握る 《★【用法】 体・衣服の部分を表わす名詞の前に the を用いる》. He held me by the arm. 彼は私の腕をつかまえた. The girl was holding a doll in her hand [some packages in her arms]. 少女は人形を手に握って[いくつかの包みを腕に抱いて]いた. He held his head in his hands. 彼は頭をかかえた. The man was holding a pipe between his teeth. その人はパイプをくわえていた. hold the door open (for someone) (ある人のために)ドアを(手で押さえて)あけておく. hold oneself still [erect] 体をじっと[まっすぐに]している. Hold your head straight a second. ちょっとの間頭をまっすぐにしていなさい. hold a person in suspense 人を不安に[はらはら]させておく. Astonishment held me dumb. 驚きのあまり口もきけなかった. 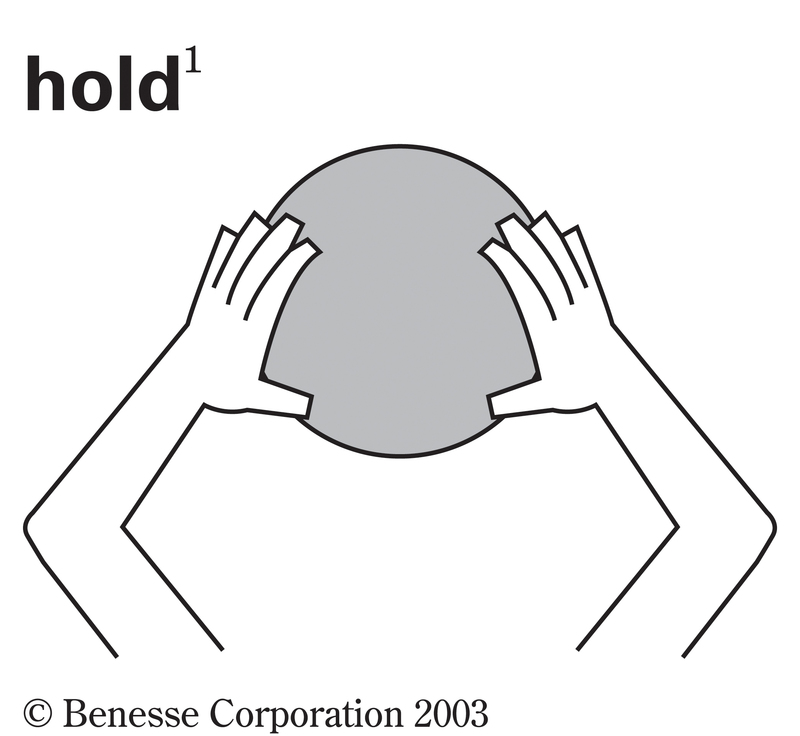 hold one's [a pair of] binoculars to one's eyes 双眼鏡を目に当てる. She was holding an ice pack to her head. 彼女は氷嚢(のう)を頭に当てていた. This bottle holds half a pint. この瓶には半パイント入る. This box holds all my summer clothes. この箱に私の夏服が全部入っている. This room can hold fifty people. この部屋には 50 人入れる. His tone held reproach [accusation] (in it). 彼の口調には非難が含まれていた. He held office for eight years. 彼は 8 年間公職[役職]に就いていた. He was held (in jail) overnight. 彼は(拘置所に)一晩留置された. hold a belief [an opinion] 信念[意見]を抱く. I still hold it in my memory. そのことは今でも覚えています. Many people held him in respect [esteem, contempt]. 彼を尊敬[尊重, 軽蔑]している人が多かった. Plato held that the soul is immortal. プラトンは霊魂は不滅であると考えた. hold a person dear 人をいとしく思う, 人を愛する. hold a person [thing] cheap 人[もの]を見くびる. I hold myself responsible [accountable] for what my son did. 息子のしたことに対しては私に責任がある(と思う). The court found him innocent, but I still hold him (to be) guilty. 裁判所は彼を無罪と判決したが私は今でも彼を有罪だと思う. She holds his opinions lightly. 彼女は彼の意見を軽視している. hold one's temper 怒らない, 自制する. There's no holding him. 彼は手に負えない. Hold your tongue. 騒ぐな, 黙っていろ. hold a press conference [a meeting] 記者会見を行なう[会合を開く]. Court is to be held tomorrow. あす開廷される予定である. He couldn't hold her affection any longer. 彼は彼女の愛情をそれ以上つなぎ止めておけなかった. The sight held his attention. その光景は彼の注意を引き止めた. The roof is held by several pillars. その屋根は何本かの柱で支えられている. The shelf will not hold much weight. その棚はあまり重いものは支えられない. hold one's liquor [drink] 酒を飲んでも乱れない. hold a person to his word 人に約束を守らせる. This contest holds a scholarship for the winner. このコンテストでは優勝者に奨学金が用意されている. Who knows what the future holds? 将来何があるか[起こるか]はだれにもわからない. They held the plane for him. 彼が乗るために飛行機の出発時間を繰り下げた. One burger… hold the pickle. ハンバーガー 1 つ—ピクルス抜きで. The tent pegs wouldn't hold in the sandy soil. そのテントくいは砂地にどうしても固定しなかった. hold onto a rope ロープにつかまる. hold tightly to the bag かばんをしっかりと握る. I hope the weather will hold. この天気がもってくれればよいが. His luck was still holding. 彼のつきはまだ落ちていなかった. The weather held warm. 天候はずっと暖かかった. The ship held on its course. その船は進路を変えないで進み続けた. The rule does not hold in this case. その法則はこの場合には適用できない. That argument [My promise] still holds true [good]. その議論[私の約束]は今なお当てはまる[効力がある] 《★【用法】 true [good] はしばしば省略される》. Hold to your resolution. 決意は貫くようにしなさい. I don't hold with [by] the proposal. その提案には賛成ではない. hòld fórth Hóld your gróund! Don't let go your hold (on the rope). (ロープから)手を放すんじゃないぞ. 可算名詞 【レスリング】 ホールド 《相手を押さえつけること; cf. toehold 2》. lose one's [its] hold on… 〈人・ものが〉…への影響力を失う, …の心を捉えられなくなる. announce a hold on all takeoffs 離陸差し控えを通告する. Hold my bag while I tie my shoes. Hold the rope so that you won't fall. The mother was holding her baby in her left hand. This measuring cup holds 8 ounces of liquid. The car holds four people. This bridge will hold at least 2,000 pounds. He still holds the world record in the high jump. The restaurant is always so crowded so let's hold a reservation. We're planning to hold a staff meeting next Tuesday. He holds the view that our economy will soon pick up. He is held in honor among Japanese scholars. We held that his statement was false. Hold the elevator. I'm coming. The police are holding a suspect for questioning. She was held in hostage. Please hold . I'll transfer your call. It is rather difficult to hold the students' attention. He can hold his liquor no matter how much he drinks. Our supply of food won't hold long. The rule holds in all cases. He managed to hold back his anger. He must be holding something back. I'm asking for volunteers. Please do not hold back. The government has vainly taken measures to hold down prices. The police tried to hold down the riot. He seemed unable to hold down a job for more than a month. The Prime Minister held forth a new plan for economic recovery. All candidates held forth about tax reduction. In some cultures men are expected to hold in their emotions. The teacher held Fred in after school for punishment. The rain held off until the track race was over. It was hard to keep the business going, but he held on. She decided to hold on to the house. We held on to the original plan to the end. She held her hand out in welcome. We did not hold out much hope of finding survivors. The city held out for two years under siege. The supply of our food won't hold out until next Monday. We've decided to hold her over in the same position. The play was held over for another month. She spotted my critical error, and held it over me. He held up a rifle and shot at the target. These pillars are not strong enough to hold up high ceilings. Two masked men held me up at gunpoint. You're holding up the traffic. Your theory won't hold up under close examination. Take hold on the rope. The police finally caught hold of the suspect. She has a hold on the committee. The secretary put me on hold for three minutes. How long does our supply of food and water hold? This nice weather will hold warm for a while. All we have to do is hold together. holdは「(動きのないもの・あるものを)一時的におさえておく」であるのに対して, keepは「比較的長いあいだ保つ」という意.そこで,Hold it. には「それをもっておけ」と「動くな」の意があるが,Keep it.は「それをとっておけ」の意のみ.Hold the elevator. は「エレベータのドアを開けておいてくれ」,Keep the elevator.だと「エレベータを管理する」という意になる. Hold your mother in hand when you cross the street. Mothers hold their babies in their left hands. Hold my bag while I tie my shoe. This truck will hold 5 tons of gravel. The nail won't hold the picture. We held that his statement was false . Hold the nail while I hammer. Please hold (the line). I'll transfer your call. I find it rather difficult to hold my students' attention. He managed to hold back his anger until she had left. You must be holding something back. She has not held down for more than three months. The teachers held Fred in after school for punishment. He will hold off his departure until he gets her positive response. We can hold off the angry mob only temporarily. He asked me to hold on while he spoke to her secretary. She held out on her husband when she got a special bonus. Let me hold over the decision until my partner comes back. Two masked man held me up at gunpoint. She's the best singer. No one can hold a candle to her. Father told his daughter to hold the fort while he's away. He held the stage for the summit talks. Your theory won't hold water. Speak now, or forever hold your place. She was holding a large box. A button on Phone Controls that places the current phone call on hold. An object (list item) that is used as the central point of tracking for an event that requires the suspension of policy. The advantage of low-order reflections holds when observations are made in dynamical regions in a case where ξg increases more rapidly than g.
The weak-phase object approximation holds for very thin specimens composed of light atoms. The kinematical theory holds only for very thin films. The disc is jet polished while it is held in the specimen holder of the microscope with a conducting paste. The carriage that normally holds the TEM specimen was removed for our modification to allow additional space to mount the Hall sensor accurately at the normal specimen position within the specimen holder. From Middle English holden, from 古期英語 healdan, from Proto-Germanic *haldaną (“to tend, herd”), maybe from Proto-Indo-European *kel- (“to drive”) (compare Latin celer (“quick”), Tocharian B kälts (“to goad, drive”), Ancient Greek κέλλω (kéllō, “to drive”), Sanskrit kaláyati (“he impels”)). Cognate to West Frisian hâlde, Low German holden, holen, Dutch houden, German halten, Danish and Norwegian Bokmål holde, Norwegian Nynorsk halda. The ability of a segment of a glass sphere to magnify whatever is placed before it was known around the year 1000, when the spherical segment was called a reading stone, […]. Scribes, illuminators, and scholars held such stones directly over manuscript pages as an aid in seeing what was being written, drawn, or read. (transitive) To contain or store. (transitive) To have and keep possession of something. Hold my coat for me. The general ordered the colonel to hold his position at all costs. (transitive) To cause to wait or delay. (intransitive) To be or remain valid; to apply (usually in the third person). to hold true; The proposition holds. To keep oneself in a particular state. (transitive) To impose restraint upon; to limit in motion or action; to bind legally or morally; to confine; to restrain. He hath not sufficient judgment and self-command to hold his tongue. (transitive) To bear, carry, or manage. He holds himself proudly erect. Hold your head high. (intransitive, chiefly imperative) Not to move; to halt; to stop. (intransitive) Not to give way; not to part or become separated; to remain unbroken or unsubdued. To remain continent; to control an excretory bodily function. (transitive) To maintain, to consider, to opine. (transitive) To bind (someone) to a consequence of his or her actions. He was held responsible for the actions of those under his command. I'll hold him to that promise. To maintain in being or action; to carry on; to prosecute, as a course of conduct or an argument; to continue; to sustain. Seedtime and harvest, heat and hoary frost, / Shall hold their course. To accept, as an opinion; to be the adherent of, openly or privately; to persist in, as a purpose; to maintain; to sustain. (archaic) To restrain oneself; to refrain; to hold back. (tennis, transitive, intransitive) To win one's own service game. To take place, to occur. He came into the hall where the wedding-festival had held […]. Elections will be held on the first Sunday of next month. An order that something is to be reserved or delayed, limiting or preventing how it can be dealt with. Senator X placed a hold on the bill, then went to the library and placed a hold on a book. War has a hold on our cultural imaginations as an inevitable force, it is peace that has no benefactor. Sculpturing gels provide stiffer hold than styling gels, which provide better hold than mousses. So I felt my way down the passage back to the vault, and recked not of the darkness, nor of Blackbeard and his crew, if only I could lay my lips to liquor. Thus I groped about the barrels till near the top of the stack my hand struck on the spile of a keg, and drawing it, I got my mouth to the hold. The beginner will instinctively try to stick his toe straight in in a foot hold, which is very tiring on the calf muscles. 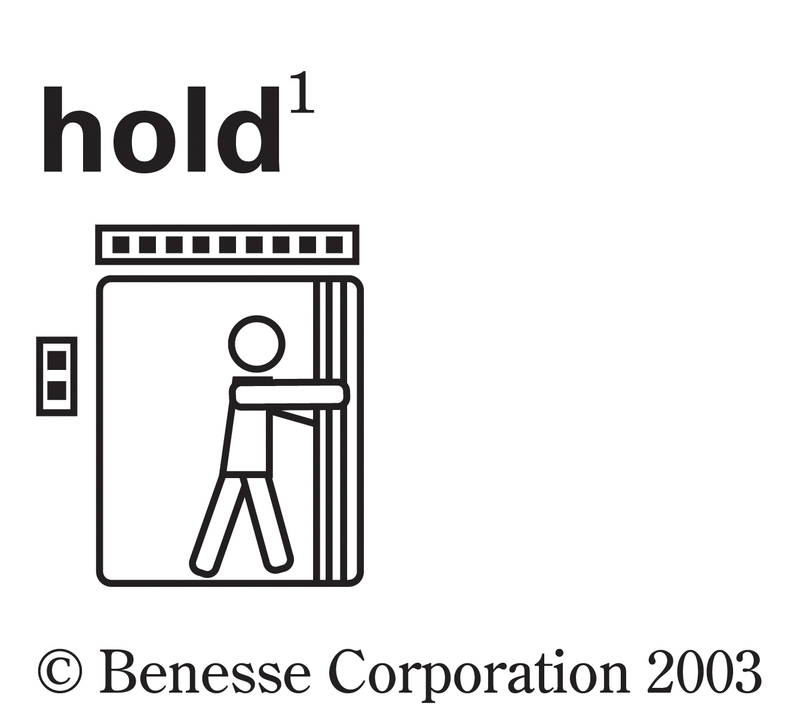 A hold facility is available; H holds, and S restarts. SCREEN 5 — Perhaps the toughest — going like the clappers sometimes works but generally you'll have to be smarter than that. If things get a little too hectic and you don't even have time to reach the HOLD key, try taking a short rest below the top of the stairs. Given that there is an average on-hold time of more than five minutes while enquiries are being dealt with, the telephone hold system provided the best opportunity. Even the "on-hold" messages on Southwest's telephone system are humorous, ensuring anyone inconvenienced by the hold is entertained. Note. After the device downloads its new configuration file, we can test placing a call on hold and the generic hold music will be heard. (baseball) A statistic awarded to a relief pitcher who is not still pitching at the end of the game and who records at least one out and maintains a lead for his team. ^ Robert K. Barnhart, ed., Chambers Dictionary of Etymology, s.v. 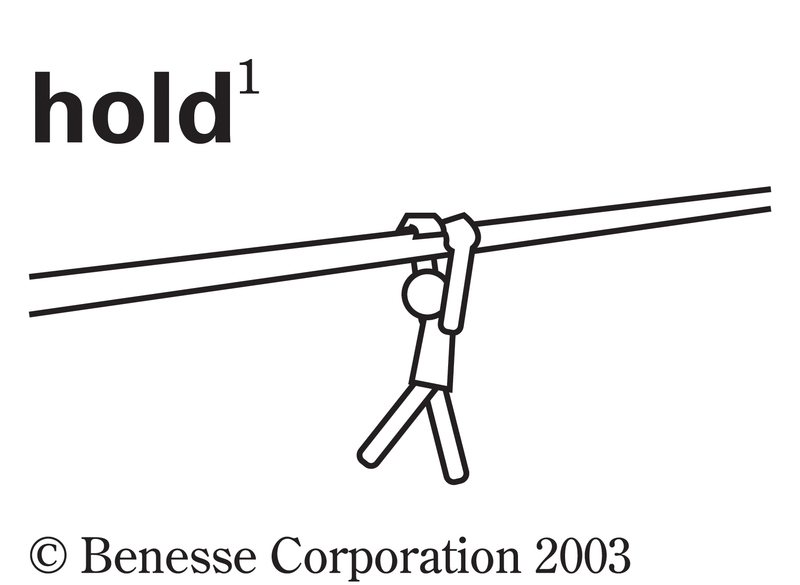 "hold¹" (1988; reprint, Chambers, 2008), 486. ^ D.Q. Adams, "Drive", in Encyclopedia of Indo-European Culture (London: Fitzroy Dearborn, 1997), 170. From Middle English hold, holde, from 古期英語 hold (“gracious, friendly, kind, favorable, true, faithful, loyal, devout, acceptable, pleasant”), from Proto-Germanic *hulþaz (“favourable, gracious, loyal”), from Proto-Indo-European *kel- (“to tend, incline, bend, tip”). Cognate with German hold (“gracious, friendly, sympathetic, grateful”), Danish and Swedish huld (“fair, kindly, gracious”), Icelandic hollur (“faithful, dedicated, loyal”), German Huld (“grace, favour”). (obsolete) Gracious; friendly; faithful; true. Alteration (due to hold) of hole. Cognate with Dutch hol (“hole, cave, den, cavity, cargo hold”). From Proto-Germanic *huldą, from Proto-Indo-European *kol-, *kwol-. Cognates include Old Norse hold (“flesh”) (Icelandic hold, Swedish hull), and (from Indo-European) Old Irish colainn, Welsh celain. Swa swa grædige ræmmas ðar ðar hi hold geseoþ. Like greedy ravens when they see a corpse. From Proto-Germanic *hulþaz, a variant on a root meaning ‘lean, incline’ (compare 古期英語 heald, hieldan). Cognates include Old Frisian hold, Old Saxon hold, Old High German hold (German hold), Old Norse hollr (Danish huld, Swedish huld), Gothic 𐌷𐌿𐌻𐌸𐍃 (hulþs). Swa hold is God mancynne ðæt he hæfþ geset his englas us to hyrdum. God is so gracious to mankind that he has appointed angels as our guardians.